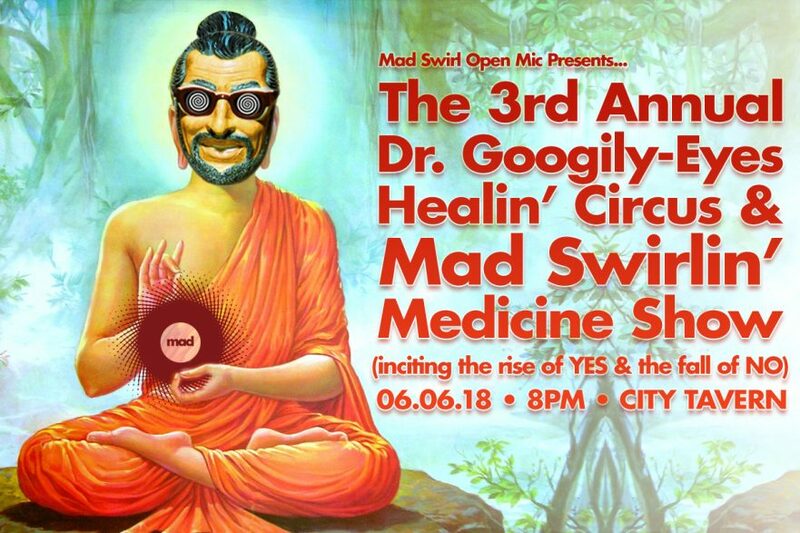 This past 1st Wednesday of June (aka 06.06.18) Mad Swirl​ hosted our 3rd Annual Dr. Googily-Eyes Healing Circus & Mad Swirlin’ Medicine Show where a whole lotta YES’es were incited and the NO’s crashed hard! HUGE YES’es to all you mad poets, performers, artists and musicians who helped swirled us up a mighty fine night! GREAT BIG YES to Swirve’s Chris Curiel and his special guest Monte Espina, for stirring the Swirl the best way in the world! More HUGE YES’es to City Tavern​’s Thad Kuiper & Noble Tse for makin’ our stay most righteous. HUGEST grats to friend & proprietor of the Tavern, Josh Florence! And lastly, but never leastly, yes Yes YES to all who came out to the Tavern & shared this loving, laughing, lasting night of poetry and music with us! Wanna view see who was who from past open mics?